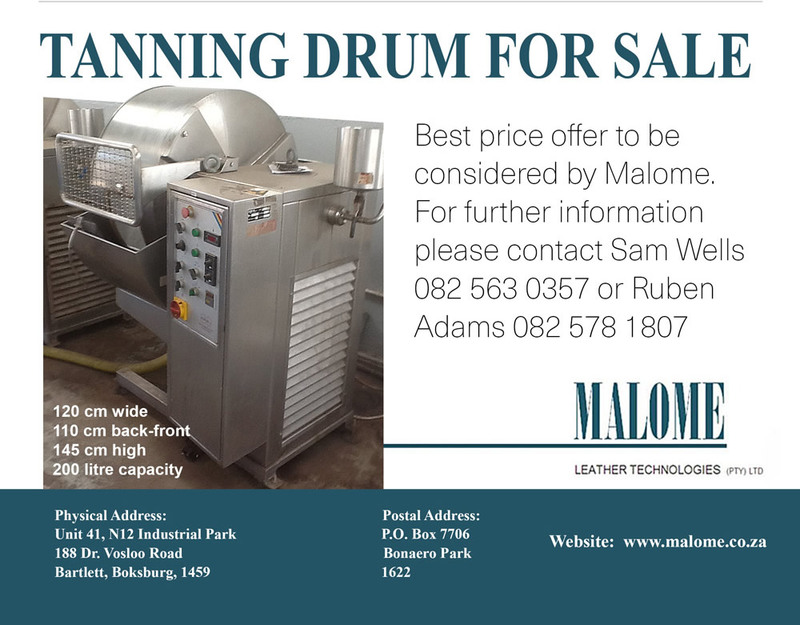 - Red meat levy extended. 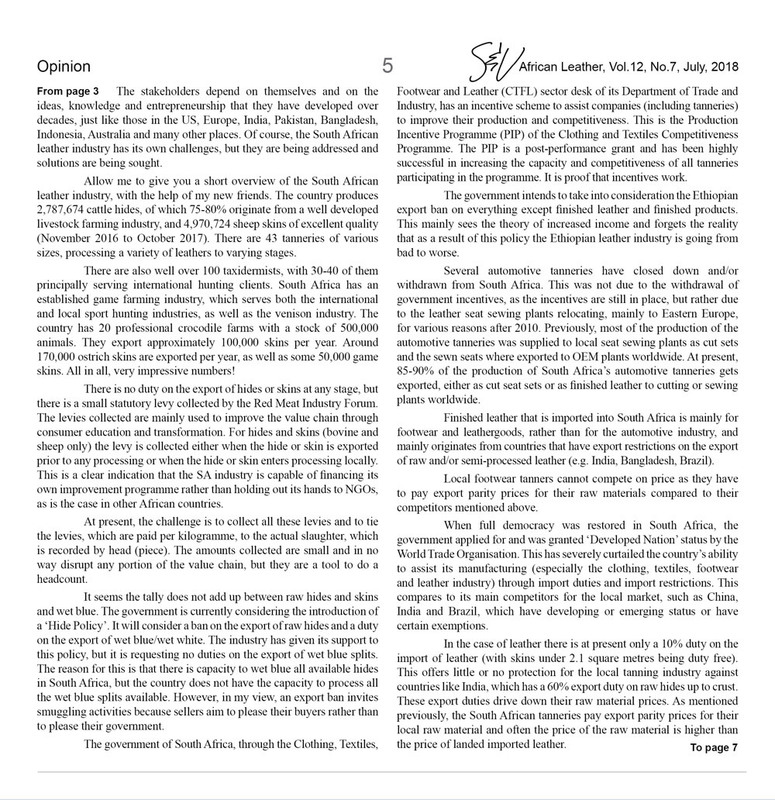 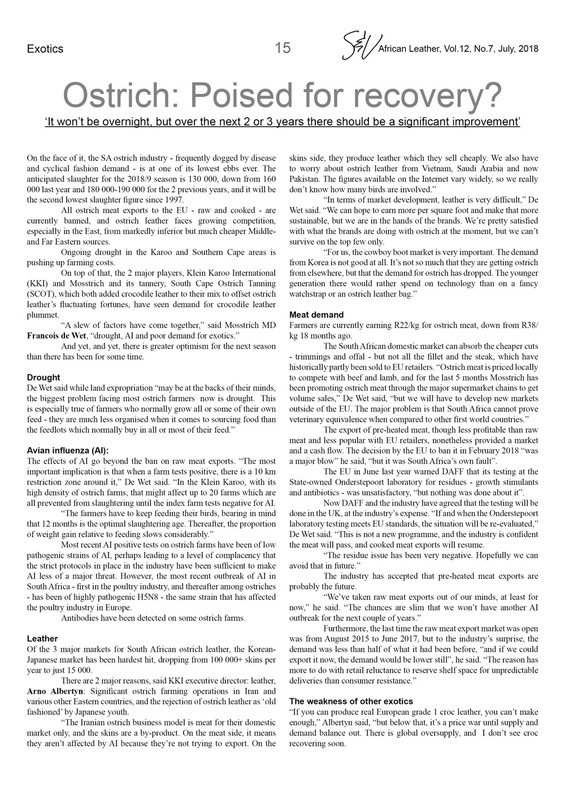 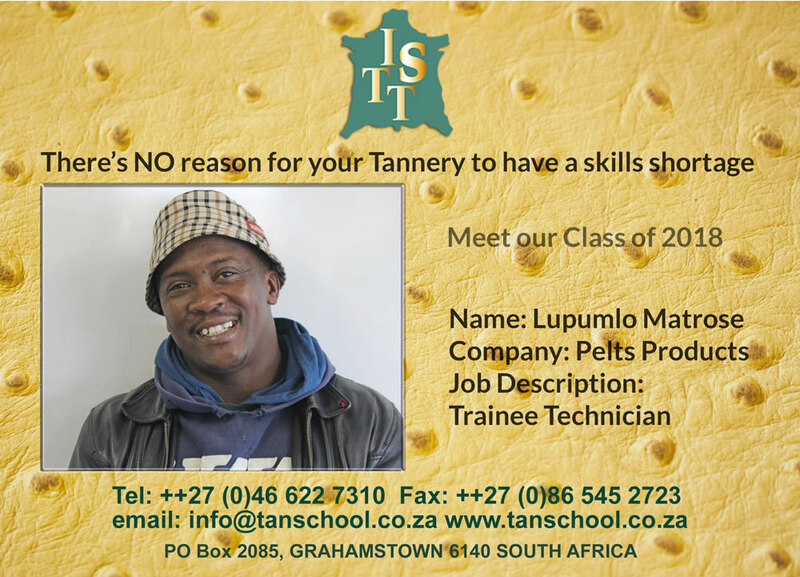 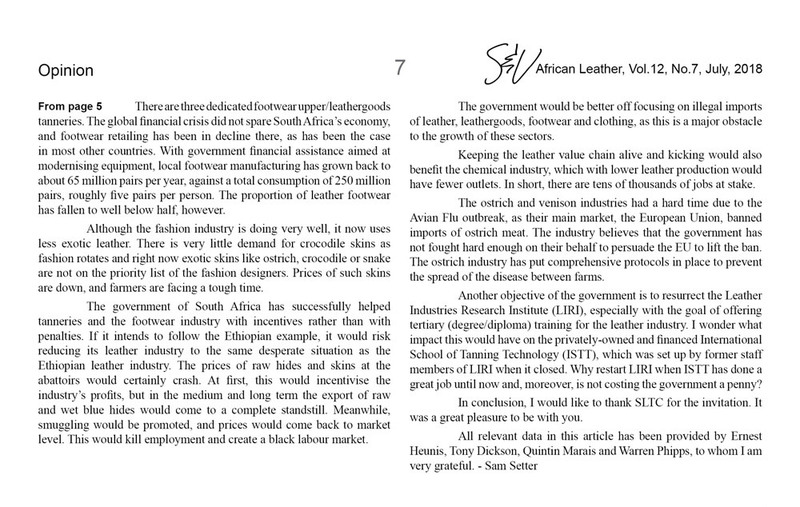 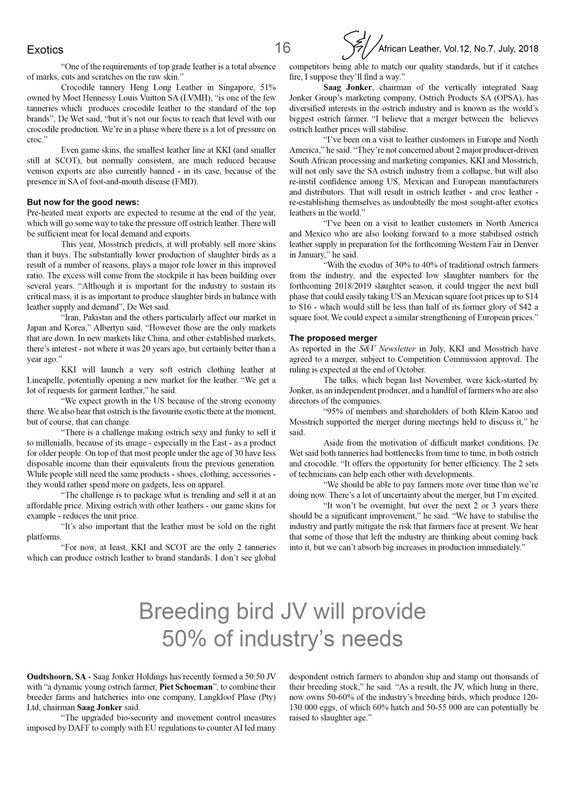 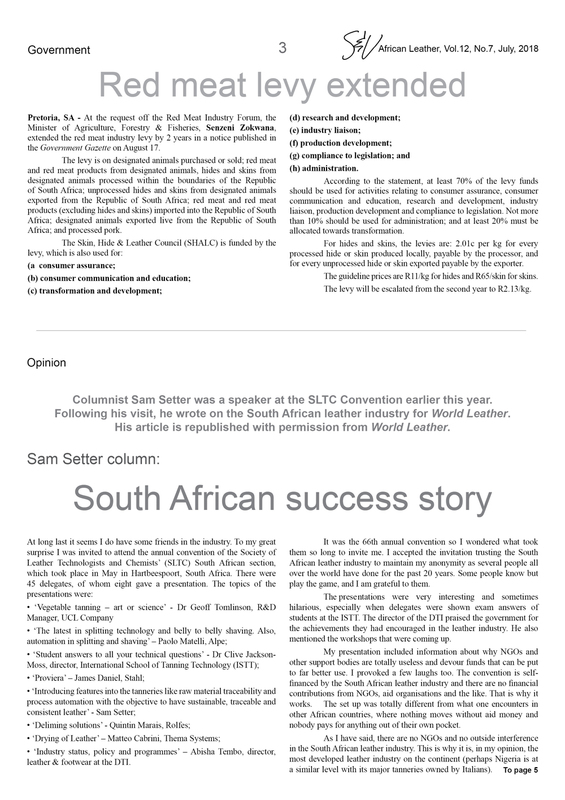 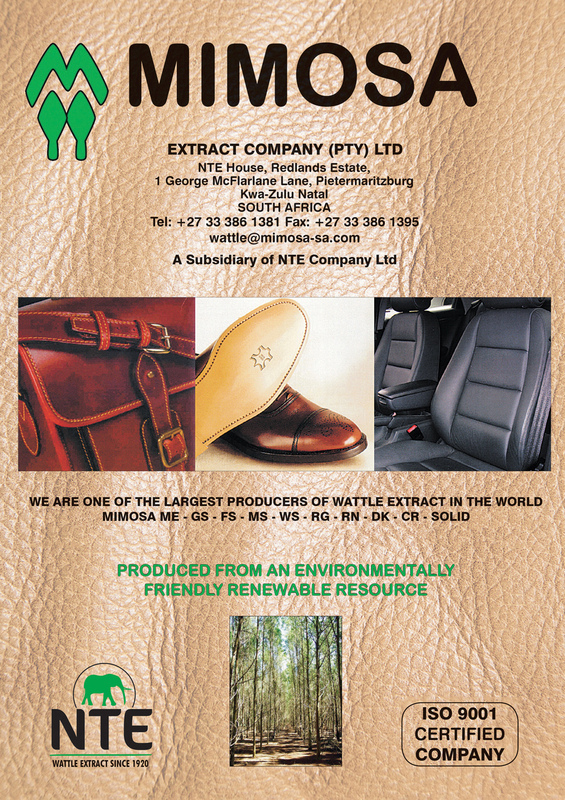 - Columnist Sam Setter writes about the South African leather industry. 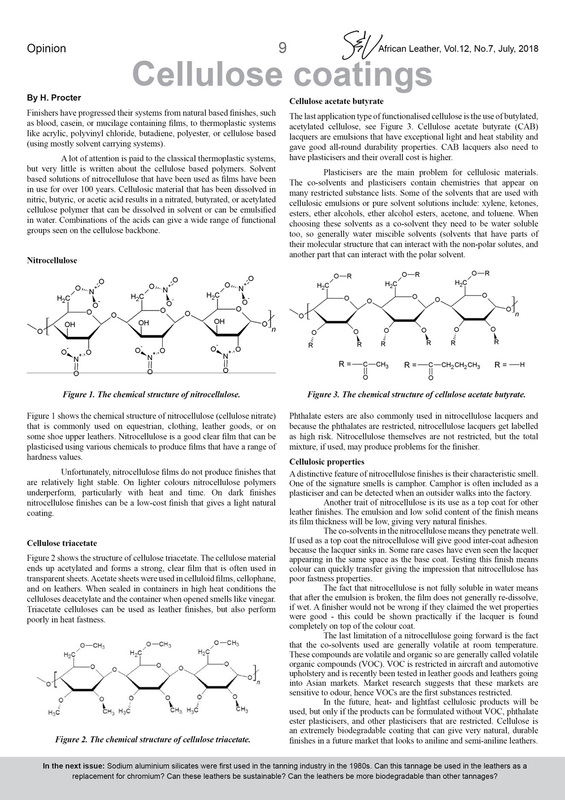 - Columnist H. Proctor writes about cellulose coatings. 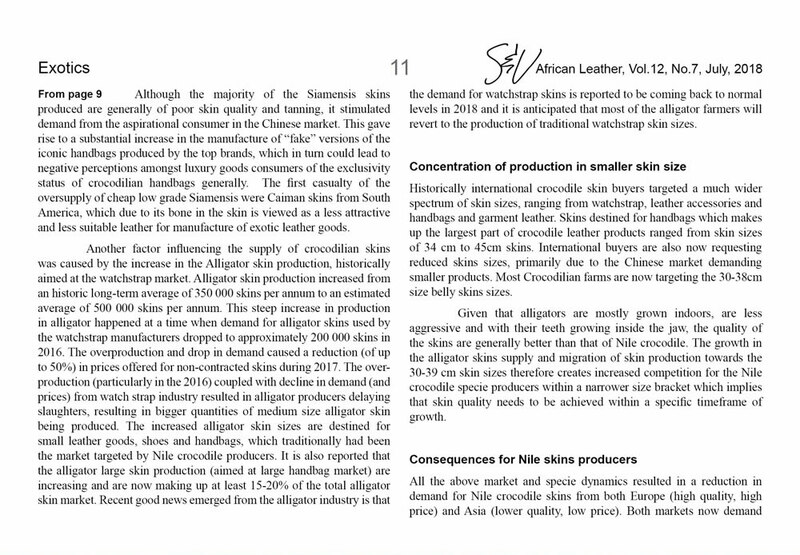 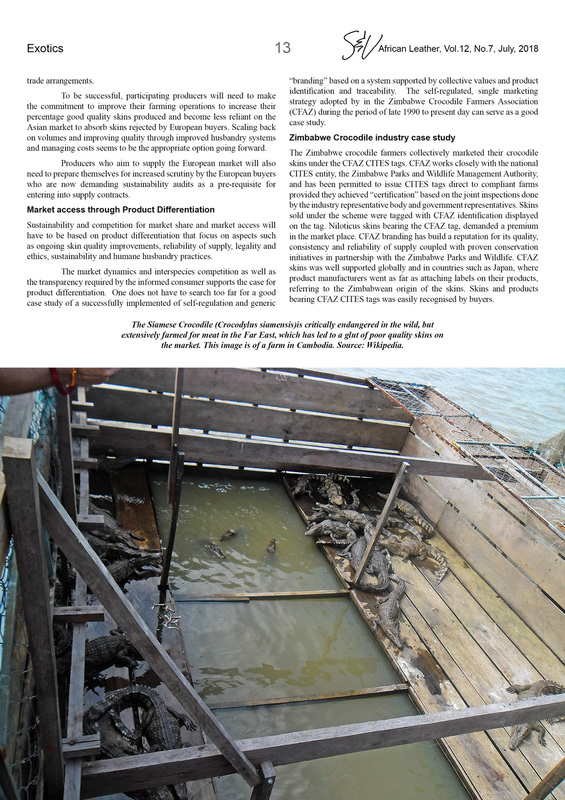 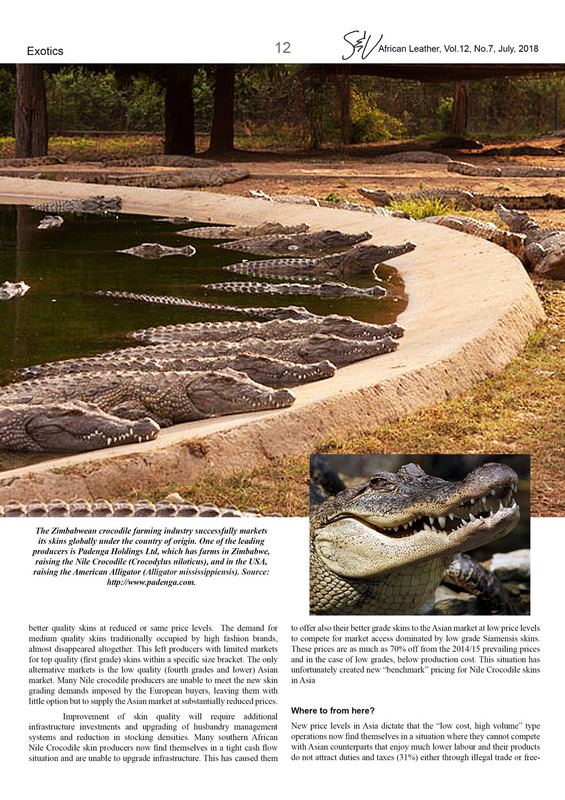 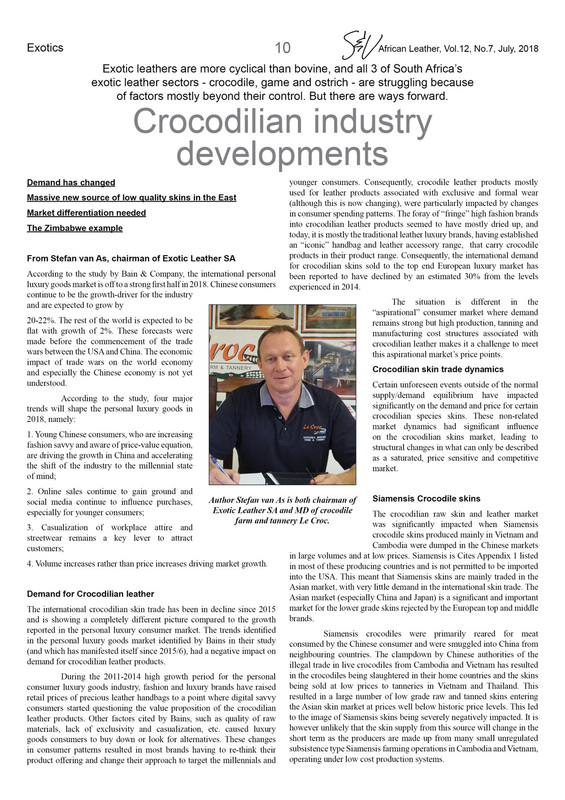 - Crocodilian industry developments by Stefan van As, chairman of Exotic Leather SA and MD of Le Croc. 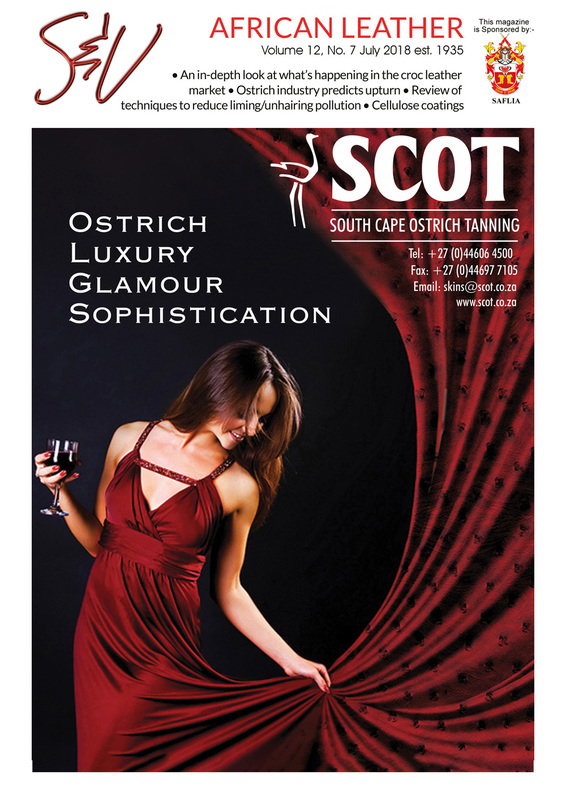 - Ostrich: Poised for recovery? 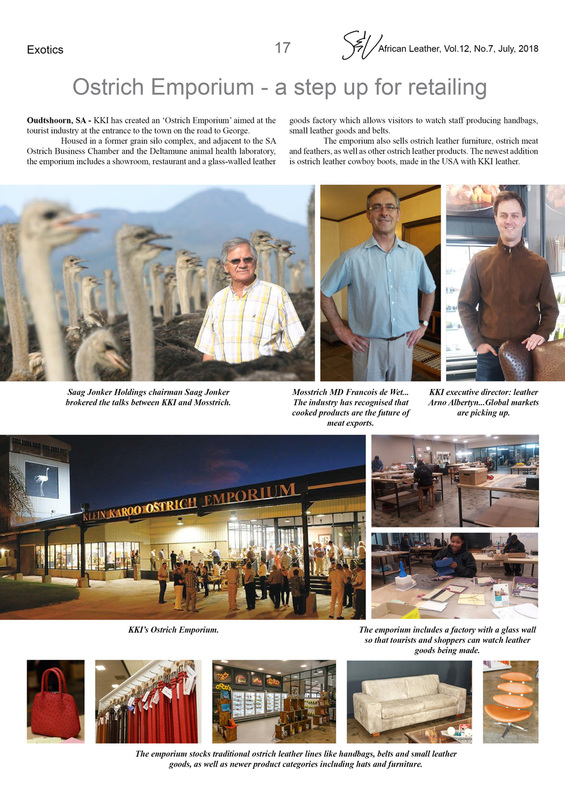 Interviews with Mosstrich MD Francois de Wet, KKI leather executive director Arno Albertyn and Ostrich Products SA chairman Saag Jonker. 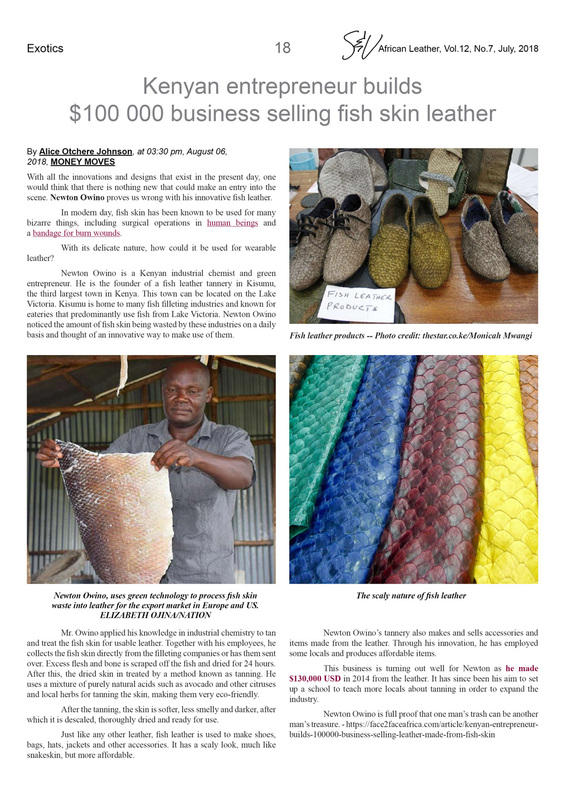 - Kenyan entrepreneur builds fish skin leather enterprise. 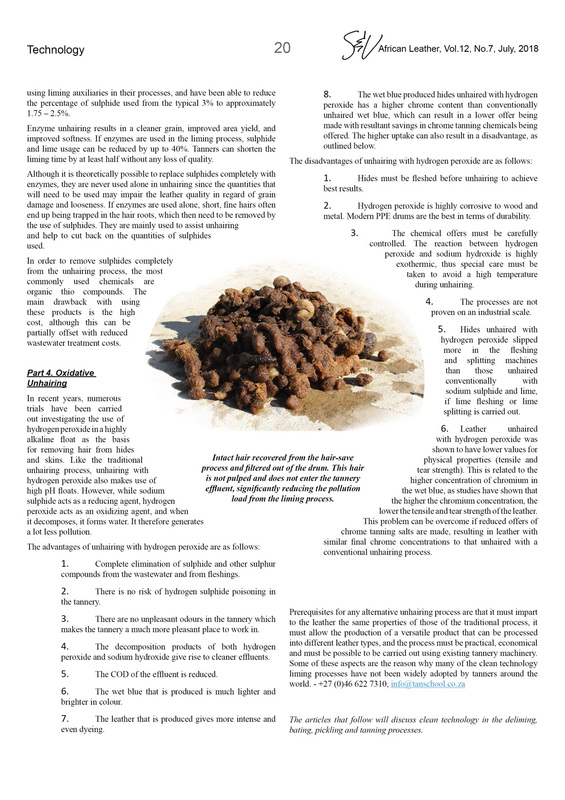 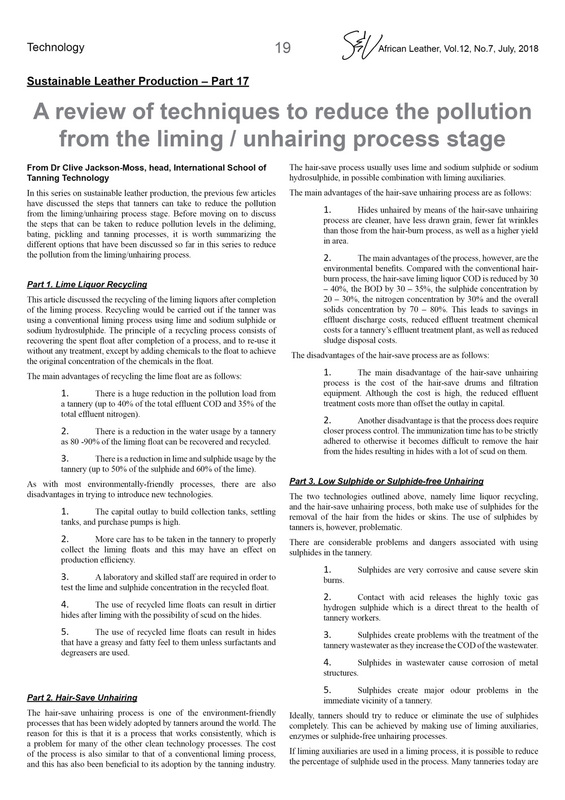 - A review of techniques to reduce the pollution from the liming/unhairing process stage by Dr Clive Jackson-Moss of the ISTT. 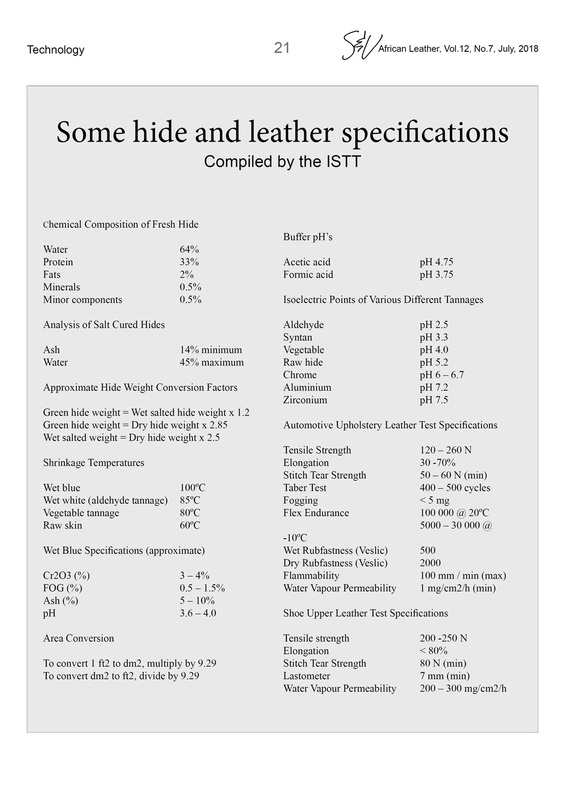 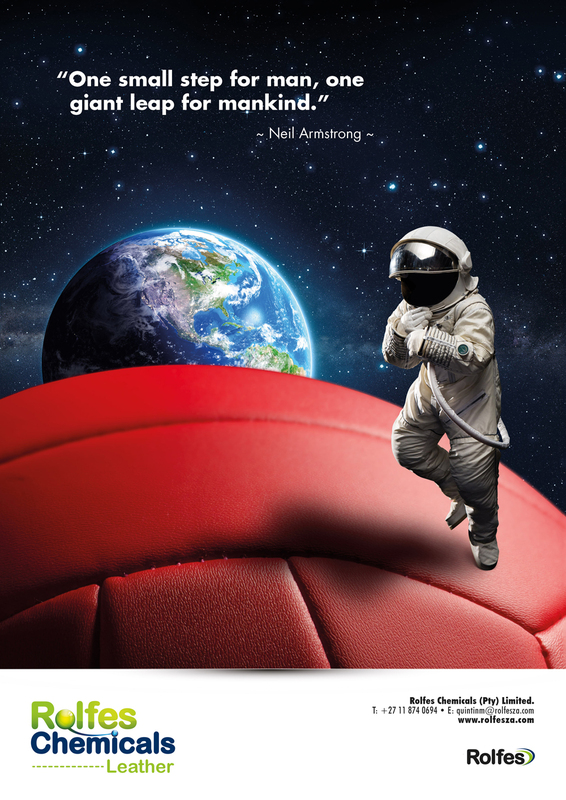 - Compiled by the ISTT. 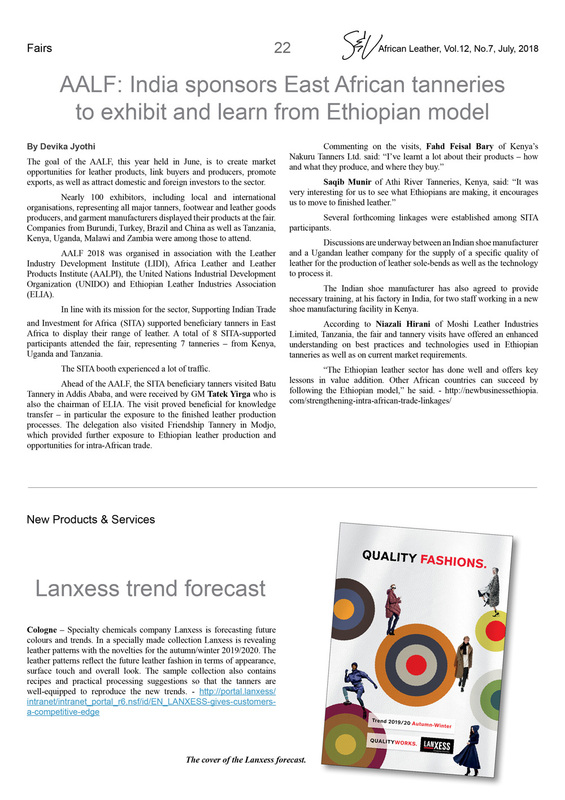 - India sponsors East African tanneries to exhibit at AALF and learn from Ethiopian experience. 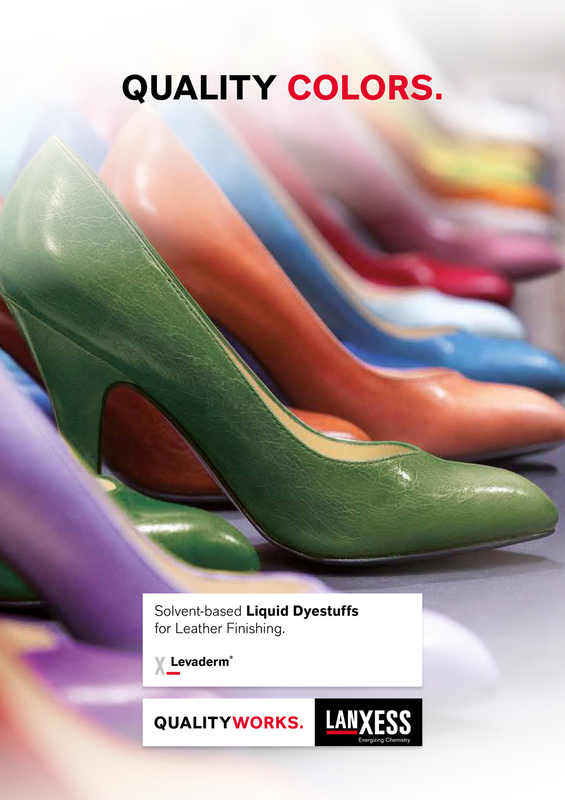 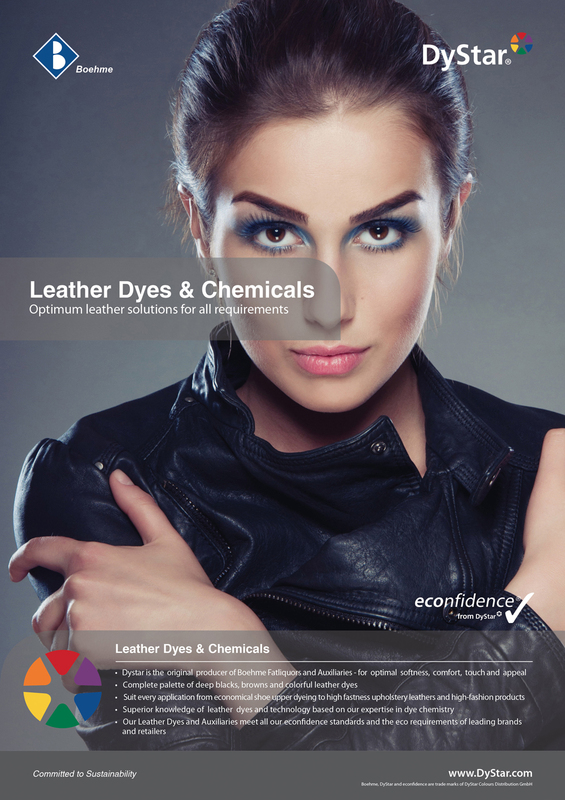 - TFL increases capacity for its dyes and retanning products. 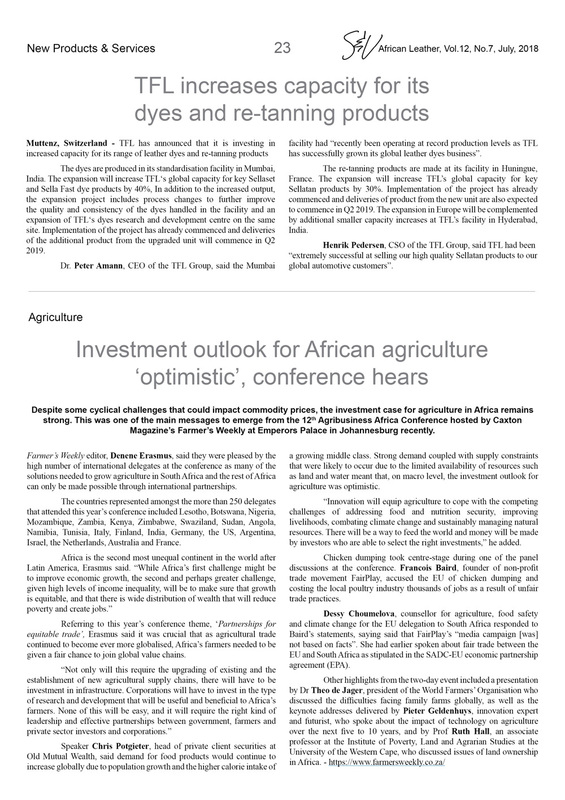 - Investment outlook for African agriculture 'opltimistic'. 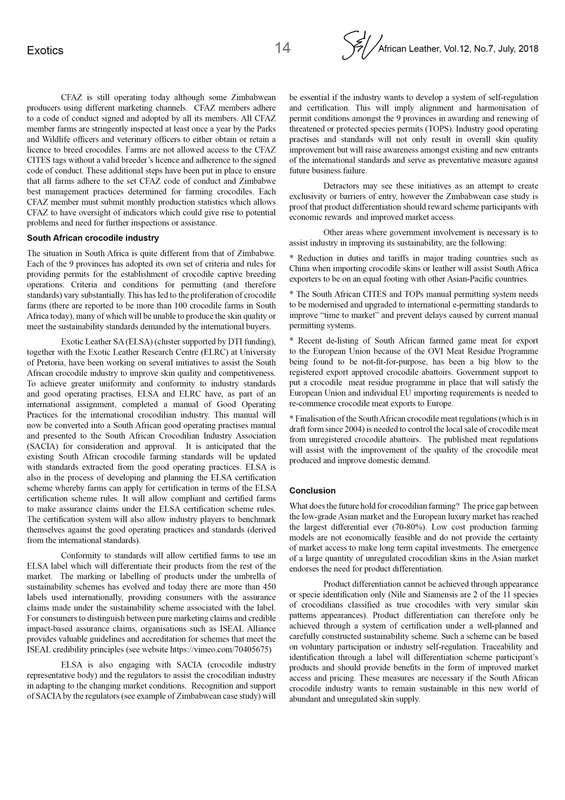 - Monsanto case 'reaffirms that robotics will shape the future of agro chemicals'. 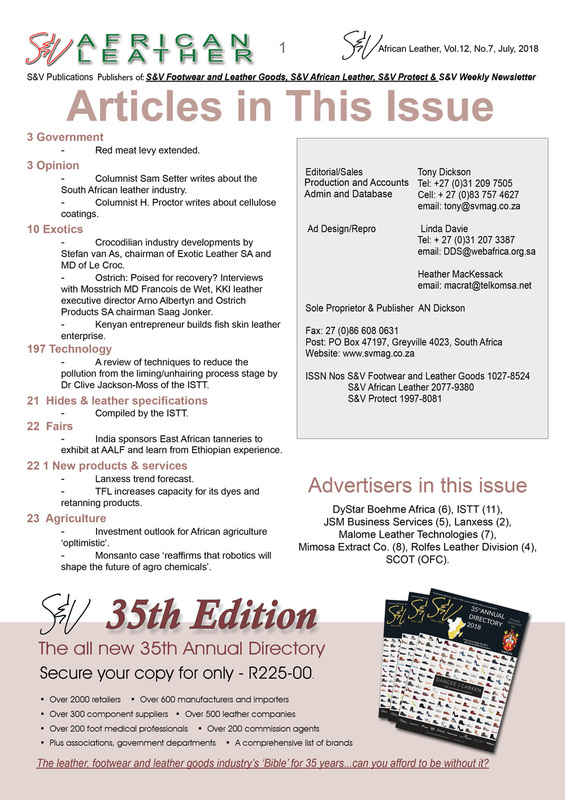 DyStar Boehme Africa (10), ISTT (9), JSM Business Services (6), Lanxess (2), Malome Leather Technologies (8), Mimosa Extract Co. (2), Rolfes Leather Division (4), SCOT (OFC).